European Promotion Manager Olivier Louis (left) represented St. Martin Tourism Office in Brussels. 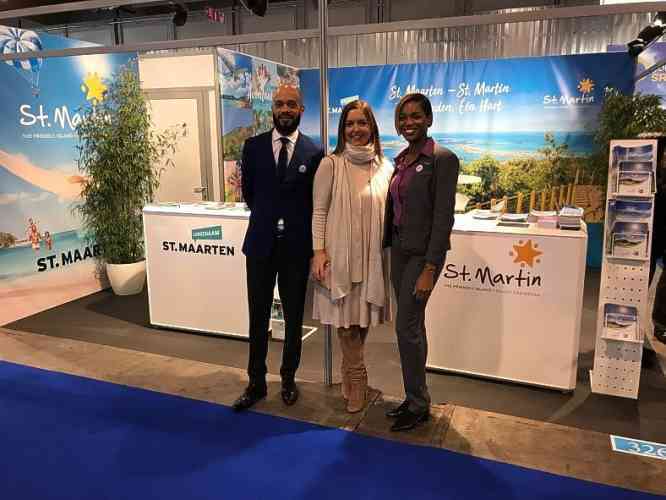 MARIGOT–The island’s respective tourism offices participated in the Brussels Holiday Fair February 7-10 where some 100,000 travel enthusiasts attended to gather information for upcoming holidays. According to St. Martin Tourism Office, Belgium has a potential population of 12 million inhabitants, grouped into three language groups – Dutch, French and German. The majority speak Dutch, followed very closely by French. German accounts for only one per cent of the population. Belgians have a strong link with the Netherlands and France, historically and culturally. This population, which has a high purchasing power, represents a very important market for the island of St. Maarten/St. Martin. The representatives of the French- and Dutch-side tourism offices, respectively Olivier Louis and Gianira Arrindell, met representatives of Belgian tour operators Thomas Cook and Rainbow that specialise in marketing the Caribbean islands. The pair presented the island’s global offering in terms of infrastructure and reported on renovations and new developments. The purpose of the meetings was also to update tourism products so they can be included in the tour operators’ schedules and highlighted in their brochures for the next season. Aware of the influence of the media, the two tourism offices organised a press trip in partnership with Star Clipper cruise ship. Five Belgian journalists will be in St. Martin this month to promote the destination in several Belgium media outlets, such as La Libre, Sud Presse, and Gazet Antwerpen.